What is Bock Beer? 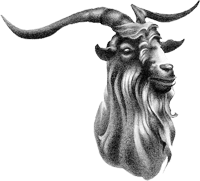 | Origins, History, & "The Goat"
There’s a lot of lore surrounding bock beer. What is it? What’s up with the goat? How did it get its name? Is it really made from the residue at the bottom of the tank? The beer we now know as bock originated in the Northern German city of Einbeck, probably as far back as the 1400s. By the 1600s it was being brewed in the Munich area of Southern Germany. The name “Einbeck” was pronounced as “Einbock” in the Bavarian accent of the region – and “einbock” means “billy goat” in German. Shortened to “bock,” the name remains with us today, as does the visual pun of the goat on the label. There are several styles of bock being brewed today. The traditional bock is dark, bottom fermented, lightly hopped, and usually has an ABV between 6% and 7%. It was historically produced in the springtime and associated with the religious festivals of Lent and Easter. Bock was also brewed by Bavarian monks to sustain them during their fasting. 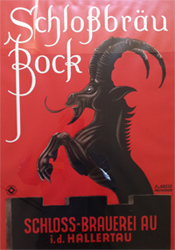 A poster for an Austrian maibock, or helles bock, from Schloss Brauerei in Salzburg. Photo by Dave Burkhart. Maibock, also known as helles bock, is associated with springtime and the month of May. It’s lighter in color than traditional bock but has a similar ABV. Mostly a little less malty than it darker cousin, maibock has a drier and hoppier character. Doppelbock has much of the same overall character as traditional bock except that the color can vary from gold to black and it contains more alcohol. Even though “doppel” means double, and the ABVs can be from 7% to 12% or higher, it doesn’t necessarily mean twice the alcohol. The monks called it “liquid bread” for its perceived nutritional value when fasting and named it “salvator” or savior. Today the “ator” suffix is used by everyone who wants their beer to be recognized as a doppelbock. There are supposedly hundreds of trademarked “ators” in Germany. Many American craft brewers are having fun with this as well. Finally, we get to eisbock. Eisbock is made by freezing out some of the water from doppelbock thus increasing its ABV. From a flavor perspective, eisbock has a definite alcohol character, not much in the way of hops, and a pronounced fruity aroma. American brewers have been brewing bock as a seasonal beer since the first German immigrants brought their craft to this country. This tradition carried on but the style evolved into a product that was little more than a caramelized version of their regular lager, especially after Prohibition. Although the Germans have been brewing bock all along, there are only a handful of commercial examples remaining in America – Shiner Bock in Texas being the best known. Craft brewers have largely gone back to the original German styles, maibock most notably. 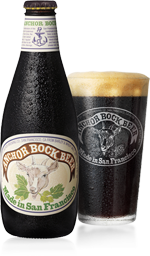 Anchor Brewing began producing a bock beer in 2005. We chose to brew our bock in the traditional bock style with a full bodied, dark, rich, and malty profile with hints of chocolate, caramel, and roasted barley. Anchor Bock also carries on the traditions of springtime brewing and including a goat on the label. And now, what about the residue theory? It is a popular and oft-repeated story that bock beer gets its dark color and stronger flavor from the residue that came from the bottom of the tanks when they were cleaned. But the venerable Michael Jackson sets the record straight in The New World Guide to Beer – just one single line is appropriately devoted to this entire topic, declaring it to be a myth! Nice post about a very under-appreciated style. My first introduction was when I was in college; there was a little brewpub owned by a German man who told me that the monks burned the malt in order to make it taste more like food during Lent. Must not have had good cooks in the monastery!